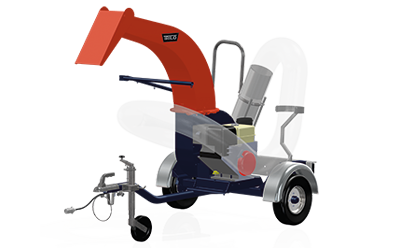 The TRILO SU40 is perfect for quickly and easily clearing and collecting of piles of leaves from inside and around sports complexes. The TRILO SU40 suction unit is mounted on a chassis that can be used as a trailer. The chassis is equipped with lights and is suitable for use on public roads at speeds up to 80 km/hour. The SU40 has a reliable 11 HP Honda petrol engine. The fan is located in a wear-resistant dual walled fan housing. The SU40 is standard equipped with a 5 m long wander hose with a diameter van 200 mm. The wander hose has a sturdy metal end piece with a hand grip. During work, the wander hose is supported by a pivoting boom and can be tucked away in a bracket. The fan housing is easy to clean. Excess water is drained via a drain with cap. The adjustable exhaust spout can be turned 360 degrees and placed at any desired angle, so that you can blow material into a vehicle’s hopper at the most inaccessible places. • Wander hose of 5 m Ø 200 mm. • Exhaust spout can be turned 360 degrees using adjustable end flap. • Fan housing covered with exchangeable wear plates.